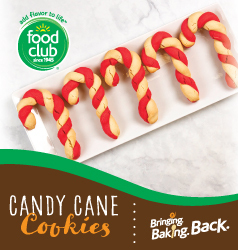 Upgrade your holiday baking game with these Food Club® candy cane cookies. Color one sugar cookie dough roll with red food coloring. Chill both the colored and non-colored dough overnight. Roll a 6-inch rope of cookie dough in red and non-colored cookie dough. Twist the doughs around each other, half, and shape into candy canes. Bake according to the package and serve.